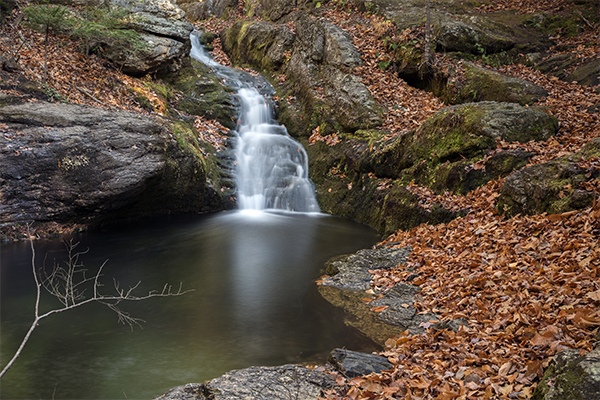 The high rating given to this waterfall is not solely attributable to the cascading waters of Rattlesnake Brook, but rather skewed by the dazzlingly attractive swimming hole created inside a giant pothole, commonly known as Rattlesnake Pool. This modest-sized pool attracts visitors from all over, not just local residents. 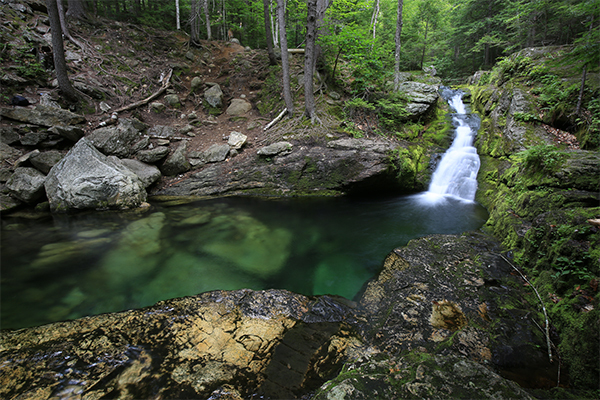 The pool carries frigid waters year-round, due to the sun-sapping overhanging hemlock trees above the pool and the always-chilly mountain water. The drawing feature of the pool is the exceptionally clean, teal-green colored water and the moss-surrounded horsetail that feeds the pool. 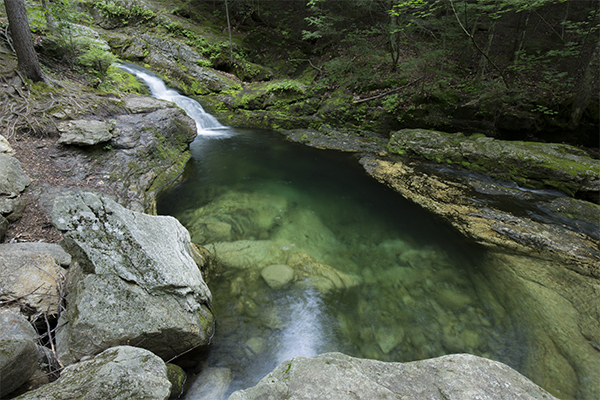 Visualize a lagoon-like pool with a romantic spirit and you will picture something similar to Rattlesnake Pool. 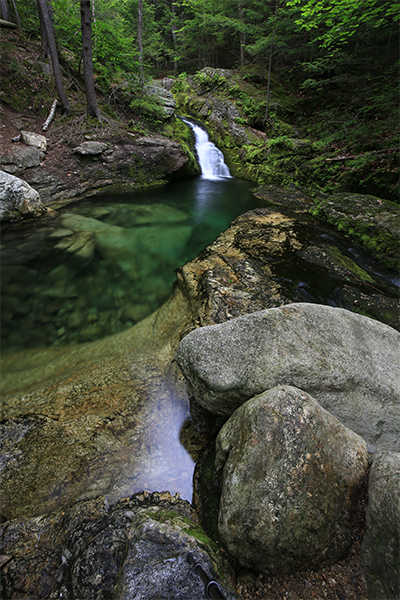 Maine is truly blessed to have such a treasure. 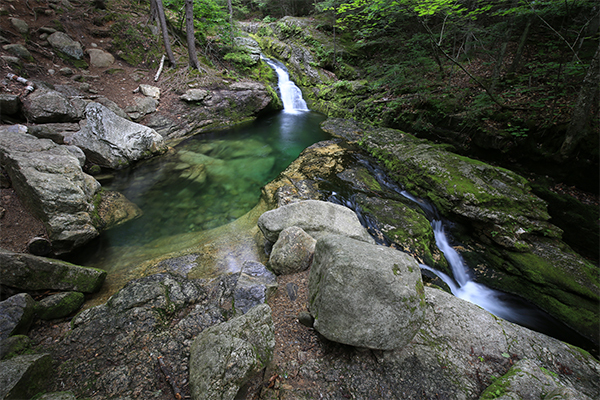 For waterfalls, Rattlesnake Brook offers two small attractions. 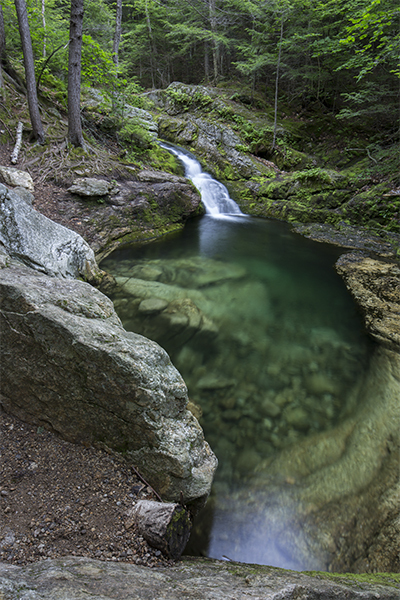 The first is at Rattlesnake Flume. 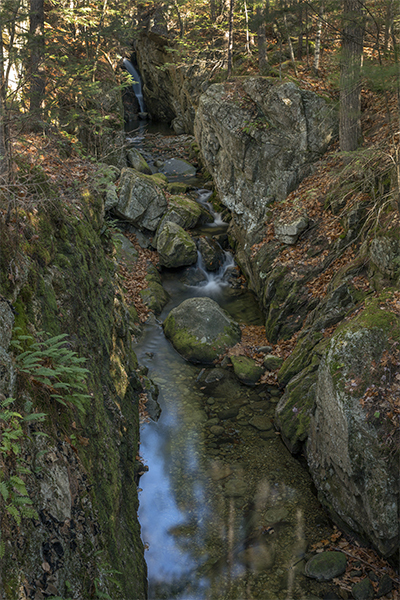 The flume consists of a 10-foot plunge dumping down into narrow gorge walls. 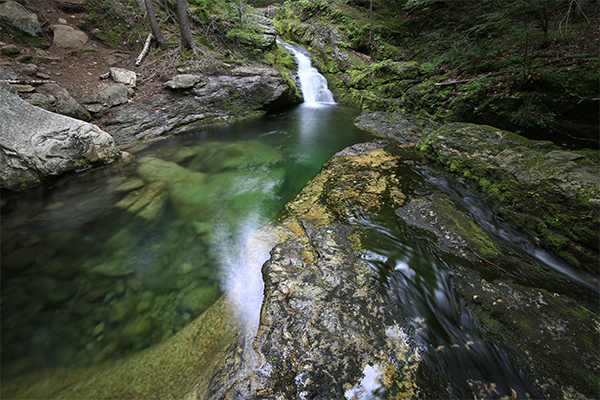 Rattlesnake Pool is fed by small horsetails, each only 3 or 4 feet in height. 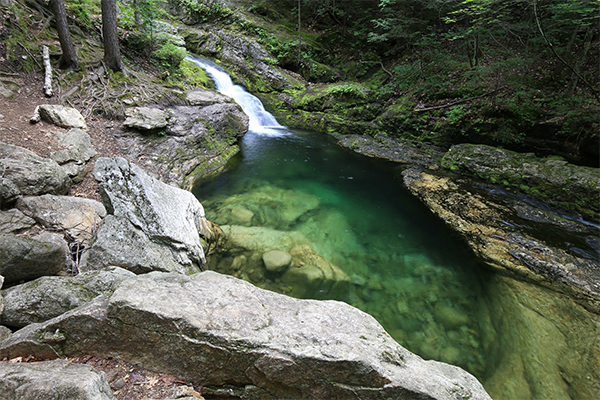 Please take note that both Rattlesnake Flume and Rattlesnake Pool are located on private property. 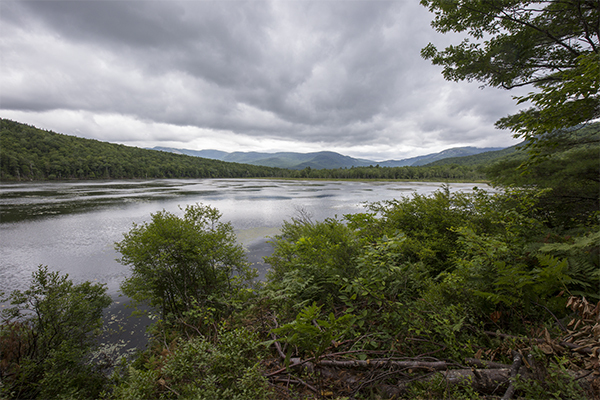 In order to keep public access to these special places, we must all do our part to leave no trace when visiting. 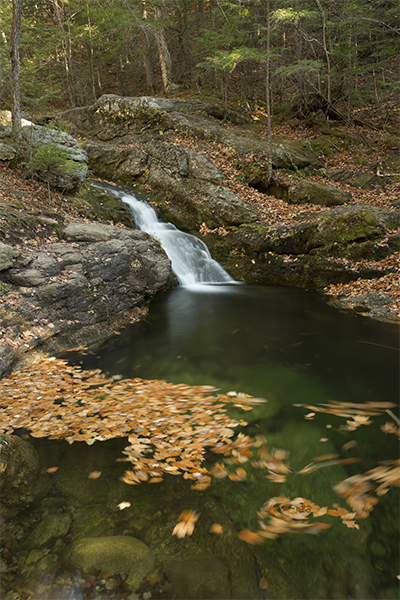 Visitors are also asked to stay on the Chatham Trail Association (CTA) trails in this area at all times. 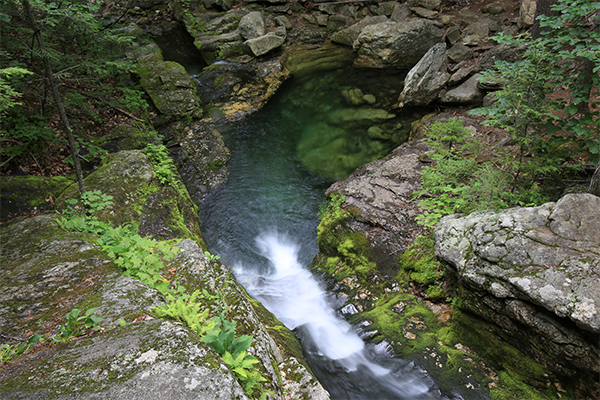 The owners have allowed Rattlesnake Flume and Pool to remain available to the public for several generations, and let's all hope it will always remain that way.